SAN DIEGO, Calif. (CBS 8) - Since John Gardner's arrest, women across the county have been looking for new ways to defend themselves. Katie Redman is a mother of two who jogs alone every morning. "I can't stop living and I need to be prepared," she said. Chuck Garlow is the owner of California Police Equipment. He says since John Gardner's arrest, women from all over the county have been arming themselves with non-lethal weapons like stun guns and pepper blasters. Garlow is a retired deputy who carries the Kimber pepper blaster in his own car. "You pull it out and point it at the assailant and most of the time you would tell them don't come any closer, and if he comes any closer you would shoot him," he said. Tasers are another big seller. Barbed probes hook a bad guy like a fish and shock him into submission. 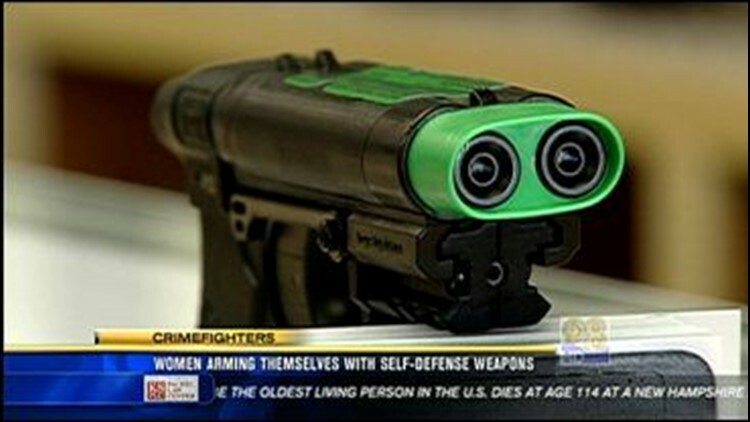 You may also consider buying a new pepper spray gun equipped with a laser sight that fires mace at 290 miles an hour. But Garlow says whatever you buy, it won't do you any good if it's buried in a backpack or purse.